After the Russian-Vietnamese negotiations came to an end, Dmitriy Medvedev, the head of the Russian Government, said that after 2013 the parties will discuss the project of creating a free trade zone. 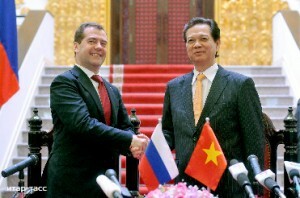 “We have discussed the prospects of mutually beneficial economic cooperation within the framework of the free trade zone, outlined the plan of necessary activities to create it, agreed on developing the relationship between he Socialist Republic of Vietnam and the Customs Union”, — the Prime-Minister of the Russian Federation said. “The negotiations of creating a free trade zone will start next year, I hope they will be successful”, — Dmitriy Medvedev pointed out. The head of the Russian Government and Nguyễn Tấn Dũng, the Vietnamese Prime-Minister reached the agreements on a number of intergovernmental projects in the energy industry sphere. According to Medvedev, first of all they touched upon the issue of constructing the first nuclear power plant in the Socialist Republic of Vietnam, in which the Russian experts are to be directly involved. The heads of the government also paid attention to the joint projects in the fuel and energy complex of Vietnam, in which Gazprom, LUKOIL and TNK-BP are engaged. Medvedev also emphasized that within he framework of the cooperation of two countries in the humanitarian sphere there is a possibility of creating the Russian Technological University in Vietnam.